Television journalist Smith retells a rousing story of WWII resistance to the Japanese occupation of the Philippines, with emphasis on the American players. The events he chronicles took place on Negros Island, the fourth largest in the Philippines. In addition to its Filipino population, the island housed a number of American missionaries, sugar plantation managers, educators, and businessmen, most of whom retreated into the mountainous interior after the Japanese occupied the seaside towns. Smith delves into their backgrounds, explaining how they came to be in the Philippines, then describes how a good number of these men, along with escaped American POWs, joined the resistance forces carrying out hit-and-run operations against the Japanese. It didn’t take long for the occupying forces to start reprisals, with a vengeance, and the evacuation of noncombatants was undertaken at great risk to them and to the submarine crew of the USS Crevalle. 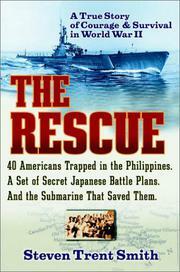 In a parallel story, Japanese plans for the “Decisive Battle” of the Pacific had fallen into the hands of James Cushing, an American leader of the resistance movement on the Philippine island of Cebu, and these too had to be picked up by the submarine. Smith sets a gentle course for the early pages, providing a wealth of biographical details to give readers a stake in the story, then gets pumping when the action starts in earnest. The writing is trim and unornamented, at times resembling that of a not-so-true adventure magazine (Cushing’s “exploits were the stuff of legend”), but this works fine for the stirring events at hand. Smith closes with the Battle of the Philippines Sea, giving readers a sense of the importance of the Crevalle’s cargo.